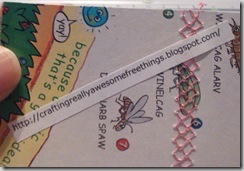 You are here: Home / Great Deals / Bloggy Bootcamp Recap! 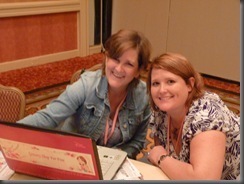 I went to Bloggy Bootcamp this past weekend and had a great time! 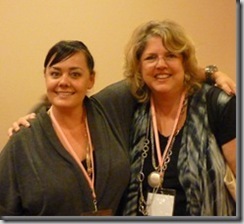 I hung out with Susan from Permanent Posies and met alot of other bloggers while I was there! I have family in Austin, which is where it was held, so I stayed with my brother – not at the hotel, and I got to see my niece and her children and my daughter and her kids and my brother and my nephew! Tons of fun the night before! I learned alot that I will be putting into practice around here to help y’all and me more! I won’t bore you with all the other “blogging stuff” I learned – however, if you are a blogger and want to know what I learned, just email me and I will send you the notes and handouts! I want to share with you some of the people I met and their blogs! I think you will enjoy them! Tiffany was our host – and she is very pretty – I know this because she told us – many times! :-) So, that is the #1 thing I learned! Here she is with Susan! She did an awesome job of making everyone feel welcome, comfortable, and connected. She is an awesome speaker and director – it couldn’t have been easy to keep everyone on schedule and get all of the info in and covered in the time allotted but, she did it. I didn’t feel like it was rushed or I missed anything, it was very well put together! I thought I was going to be with Susan all day – she would be my “security blanket”, since I really didn’t know anyone else…, but right away we were put at different tables and continued to be moved throughout the day to different tables to give us the opportunity to meet alot of people! So, right away, I was separated from Susan and on my own – now, I can talk to you guys all day – cause I can’t see your faces and know if I am boring you 🙂 but, in real life I am not one to run up to you and say …well, anything! lol So, I was nervous! At lunch we had assigned seating, too and there I met Janet from Love 2 Coupon! She is very nice and I enjoyed spending time with her. We met for a few minutes after everything was over to talk about “business”! I was also able to finally put a face with a name I knew from the “blogosphere”, Karen Perea! She, in fact, will play a large roll in an upcoming giveaway that you will be happy to learn about, stay tuned! While there at each opportunity we passed our business cards around, I got some very unique cards throughout the day. 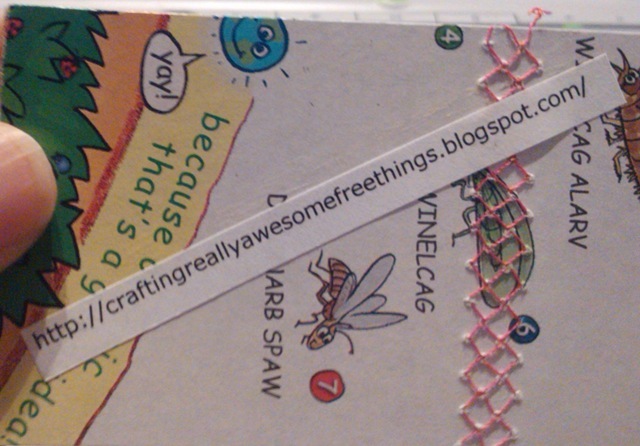 I got one with candy attached from Anna of Crafty Girls Workshop, and I got a couple of 1 1/2” x maybe 3 1/2” cards – too cute – I thought they could also be used as tags! I got one of those from Robyn from Imperfect Nest, she said her hubby made them for her and they had scenes of Austin on the back! 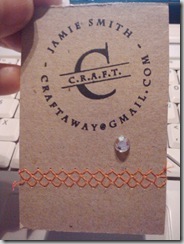 I also got one of those from Holly of Integrative Mom – she ha d a great pic of her with her baby on the back! They said they got them from Moo Cards. My friend Beth from Two Monkeys & a Washtub, was there as well – I met Beth at the Uncle Ben’s get together earlier in the year! Then at the after party, I met Bethany of Bethany Anna! Who is alot of fun and really nice to talk to! I also ran into Brandi of Free Sample Freak a few times – we met at the Logitech mixer last year! Make sure to drop in on these people and see what they’re all about! I’ll write another time and tell you about the sponsors and speakers! I would love to see your notes! I’m kind of new to blogging & would appreciate it tremendously! I read this earlier and forgot to comment. We like the comments. So here it is. Great post! I enjoyed the weekend. @Susan Merritt: Lol! Thanks for the comment! It sounds fun. 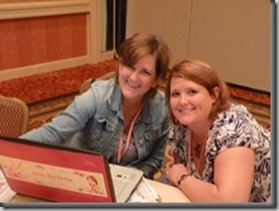 I’m going to the San Diego Bloggy Boot Camp next March and I’m getting excited reading all the recaps! @Kay Lynn @ Bucksome Boomer: Oh, you will enjoy it, it was a blast and I learned alot! @Bethany: Thanks, I enjoyed our talk, too! Love the Spanx posts, too!